The above portfolio of RJ is as declared to stock exchanges as on Oct 31, 2006. I shall update the same as and when more information is filed with the exchanges. 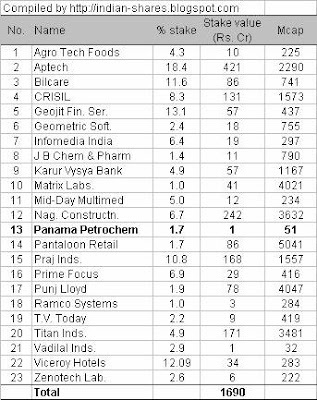 Note: Panama Petrochem Ltd is the new stock addition to the master investor’s portfolio in September 2006 quarter. I shall shortly post more research on Panama Petrochem on this blog.